Oh, hello – I’m Melissa. I thrive on people who inspire me. Those brave souls who are growing gardens, being community leaders, or creatively building beautiful, healthy public spaces that inspire. That kind of stuff. This blog will highlight inspiring people, projects, and stories as documented in my sketchbook and through the lens of my camera. I am a Northwest girl exploring my world through the pages of my sketchbook while caring for 6 delightful, jumping Nubian goats. Four new babies joined our herd in April, 2016 and we named them Waylon, Willie, Merle, and Miss Maple (the only girl). Baby Willie and Mama Mickey just hours after his birth. Currently, I reside on Urban Eden Farm in fabulous Spokane,Washington. I love french press coffee, simplicity, sketchbook journaling, Oaxacan cheese, getting my hands in the dirt, writing letters, people watching from a park bench, and the power of human connections. Professionally, I am an ESL (English as a Second Language Educator) educator and food literacy trainer. Lover of big mountains and the mind boggling views they give us. I have five goats with baby goats on the way. I had a pet hedgehog in high school. I think some of the most amazing people in the world are the oldest and the youngest ones. I can shell sunflower seeds in my mouth faster then anyone I know. Want to give it a go? I have eight nieces and nephews who I adore. Kids allow us to live a little piece of our childhood again through their eyes. Most of my closest friends have names beginning with S. My two older sisters, too. Odd. I also like to take photos of my feet in different places. And plates of food. Strange, I know. Hopefully you too will find inspiration in their stories and be inspired in your own life. Sassy feet in my new cowboy boots in Santa Fe, New Mexico. On the farm – Goat grain and muck boots! Feet in black sand in Nicaragua. 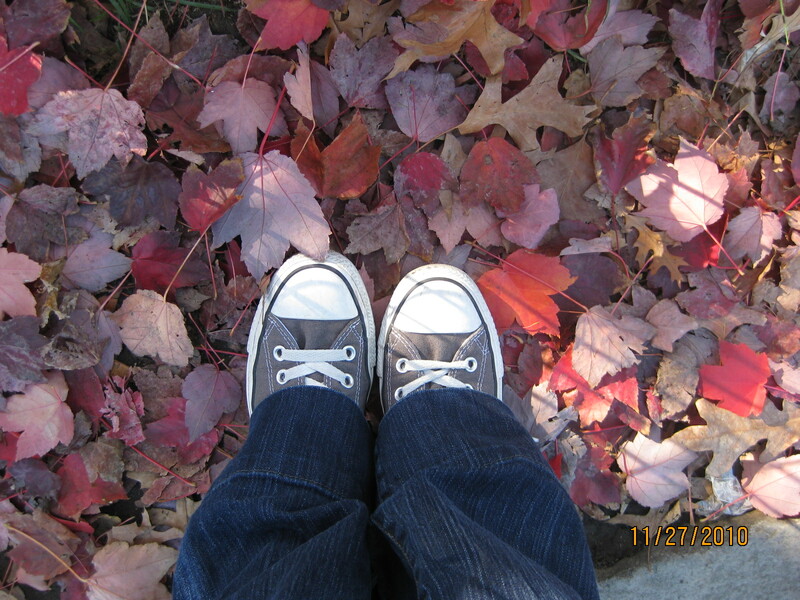 Feet in red leaves in Central Park in New York City. 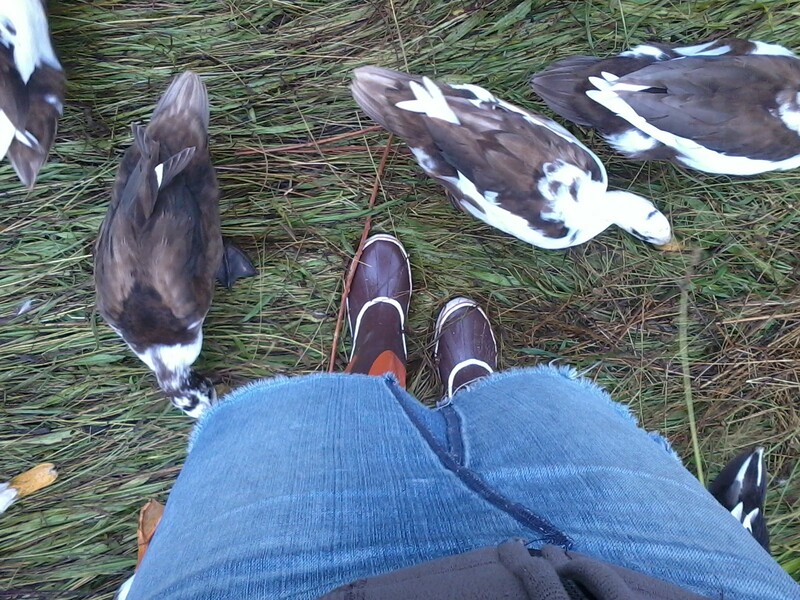 Feet and ducks at Lost Valley Education Center in Oregon. There, are you satisfied? Enjoy. Thanks for following me! I’m looking forward to more feet shots! I love how your are documenting your animals, and am always looking for project ideas. Your blog is fun! Wow! Thank you for the nice words. I have been blogging for a while, but just did a re-design that focused on a bit more on images. Lots of free designs are on WordPress now. Guess it was a success! That was a fun introduction….very nice to meet you. I am glad you liked it Billybuc. Thanks for reading, and nice to meet you too! Your fun facts made me smile. 🙂 I think your blog bio is great — full of personality! I like it. Feet shots different places, I already tried with shoes, but fantastic. Thank you! It is a fun way to document where you go. Every place on the ground looks a bit different. Thanks for stopping by, Yamkin! Love the energy in this. Look forward to reading more! Thanks for connecting, Chez Shea! Blogging is really fun, and I am always impressed with the richness of content and community building to be found. Cheers! Your photography reflects my desire of clicking pictures of things that most people overlook. Thanks! I would really enjoy taking more photos….I have fallen a bit out of practice. Hey hope things are good with you , Haven’t heard from you in a while . Hi , did you say Goat Milk Soap???? …hopefully you will post about it right ? Goat milk soap, indeed! Fun, right? We have a whole bunch of extra milk since we have weaned our babies goats off of Mom. There are some fun projects happening. 🙂 Good to connect with you again, Patch! And I do have a post I am crafting for this weekend. Thank you so much for stopping by, Sindhu! I see we share a love of food that is good for you 🙂 Cheers! I am here because of the lovely Sarah at Miss Gentileschi and I am delighted to have found you. Not just because of the goats you understand, though it would be a fib to say that I am not captivated by them. But your work is delightful and I believe it will be my delight to follow you. Hello. How wonderful you found me through Sarah! She is a dear friend, and I am happy to make our circle grow. I do have goats…they are so fun! I am so happy you enjoy my work, and I am inspired by my everyday life and connection with wonderful people that come into my path like you. If you like, send me your address, and I will send you a handmade card via snail mail card that I send to my new followers via snail mail. Happy Tuesday to you, friend!